The footballing rivalry has diminished somewhat since the late 1970s, particularly since the annual fixture stopped in 1989. For England, games against Germany and Argentina are now considered to be more important than the historic rivalry with Scotland. The BBC website has commented that the games "have represented all that is good and all that is bad about football since the fixture began," while The Guardian newspaper once reported that "for millions across both sides of the border the encounter represents a chance for the ultimate victory over the enemy." As of June 2017, the teams have played 114 matches; England have won 48, Scotland 41, and there have been 25 draws. The 1928 Scotland team which defeated England 5–1 at Wembley was nicknamed the Wembley Wizards. The match had an unusual background; England and Scotland were the two traditionally dominant countries in the British Home Championship, yet neither side had managed to beat either Ireland or Wales in their first two games of that year's Championship. The game played in 1961 saw Scotland suffer their heaviest defeat in the fixture. The performance of Scotland goalkeeper Frank Haffey contributed towards the English stereotype of bad Scottish goalkeepers. England players Jimmy Armfield and Johnny Haynes insisted that the result was more due to the quality of their forward play, and that Haffey could not have done much else to prevent most of the goals. England had won the 1966 FIFA World Cup at Wembley less than a year before the 1967 game, and were undefeated in 19 games. Despite fielding four of the Celtic side that would go on to win the European Cup a month later and stars such as Denis Law, Jim Baxter and Billy Bremner, Scotland were massive underdogs going into the match. Scotland took an early lead through a goal by Law, and Bobby Lennox put Scotland 2–0 up with just 12 minutes remaining. England were somewhat hampered by the fact that Jack Charlton suffered an injury early in the game. England manager Alf Ramsey was unable to substitute Charlton and therefore decided to use him in the unfamiliar role of centre forward. Ironically, Charlton scored England's first goal. Scotland soon reestablished a two-goal lead, however, with Jim McCalliog making the score 3–1. Geoff Hurst scored a late goal to make the final score 3–2 to Scotland. Baxter played "keepie uppie" as Scotland toyed with their opponents late in the game. The Scots playfully claimed afterwards that the victory made them unofficial world champions. Ultimately, however, it was England who qualified for the 1968 European Championship because of results in the other matches. At the end of the 1977 match, the Scottish fans invaded the pitch, ripping up large sections of it and tearing down the goalposts. This incident contributed towards the growing awareness of football hooliganism in the United Kingdom. The match was played at Wembley Stadium on Saturday 15 June 1996. Before the game, Scotland's national anthem, Flower of Scotland, was completely drowned out by booing from English spectators. The first half was closely fought, ending 0–0, although Scotland had the better of the chances. The introduction of Jamie Redknapp into the England team as a substitute for the second half helped to turn the match in England's favour, and they took the lead through a headed goal by Alan Shearer. Scotland were awarded a penalty kick in the 76th minute after a foul by Tony Adams on Gordon Durie, but Gary McAllister's kick was saved by the England goalkeeper David Seaman. Shortly afterwards, Paul Gascoigne, who played in Scotland for the Glasgow club Rangers, scored a second goal for England, after chipping the ball over Scottish defender Colin Hendry. In 2006, the year before he became Prime Minister, Gordon Brown drew criticism in Scotland when he was reported as saying that Gascoigne's goal was one of his favourite moments in football, although Brown subsequently denied saying this. Scotland long held an advantage in terms of wins, as they recorded ten wins in the first 16 matches. Scotland, the smaller country in terms of population, were superior during this period because passing football developed earlier there, as shown by the Scotch Professors who moved to play in the nascent English professional league during the late 1880s. Scotland were also dominant in the 1920s and 30s and prior to the Second World War had 29 wins in the series to England's 19. England reversed the dominance after the war, as Scotland have only won 12 matches since then. The Scots did win three games out of four from 1974 to 1977, but lost every other game in the 1970s, and have only won three times (compared to 13 English wins) since 1977. England pulled ahead for the first time in the history of the fixture with their win in 1983. Rangers defeated Leeds United home and away to qualify for the first Champions League group stage in 1992–93. Celtic lost on the away goals rule to Liverpool in the 1997–98 UEFA Cup, but they beat Blackburn Rovers and Liverpool on their run to the 2003 UEFA Cup Final. Celtic and Manchester United were drawn together twice in the Champions League group phase in quick succession, in 2006–07 and 2008–09, while Arsenal beat Celtic 5–1 on aggregate in the 2009–10 qualifiers. Until 2007, the Scottish clubs held their own in meetings with English clubs, winning 13 and losing 12 of the 37 matches. Since 2007, the English clubs have been unbeaten in these fixtures. After a goalless draw between Manchester United and Rangers in the 2010–11 Champions League, Daily Telegraph reporter Roddy Forsyth commented that the growing financial disparity between the two leagues was reflected in a below capacity attendance at Old Trafford, the defensive tactics used by Rangers, and the weakened team selection by United. Hearts suffered a record defeat against Tottenham in the 2011–12 UEFA Europa League, but performed more creditably against Liverpool in 2012–13. The most recent competitive meeting of clubs from the two countries was between Aberdeen and Burnley in the 2018–19 UEFA Europa League. There have also been a number of other competitions between English and Scottish clubs. Before European competition started in 1955, the Coronation Cup was staged in 1953, to mark the coronation of Queen Elizabeth II. Four prominent clubs from each country participated in a knockout tournament, with Celtic and Hibernian defeating two English clubs each to reach the final, which Celtic won 2–0 at Hampden. A similar competition called the Empire Exhibition Trophy was staged in 1938, with Celtic defeating Everton 1–0 in the final at Ibrox. Back in 1902, the four-team British League Cup was staged, with both Rangers and Celtic defeating their English opponents to set up a final between them (this was before the Old Firm term came into use). Many great English sides have been built around Scottish players. The double winning Spurs team of 1961 included Bill Brown, Dave Mackay and John White. Denis Law is the second greatest goalscorer in the history of Manchester United. The great Liverpool teams of the 1970s and 1980s were built around Kenny Dalglish, Graeme Souness and Alan Hansen, while Nottingham Forest's double European Cup-winning side included Archie Gemmill, John McGovern, John Robertson, and FWA Footballer of the Year Kenny Burns. The great Leeds United side of the 1960s and 1970s included several great Scottish players such as Billy Bremner, Peter Lorimer and Eddie Gray. Manchester United and Liverpool became the most successful clubs in English football, largely due to the efforts of Scottish managers Matt Busby and Bill Shankly, respectively. There have been fewer notable English players who have played in Scotland. Joe Baker was the first player to play for England without having played in the Football League, but his was an isolated example because he played at a time when a player was only allowed to play for the country of his birth. Those rules have subsequently been relaxed and the sons or even grandsons of Scots are now allowed to play for Scotland. This means that some footballers born in England have played in and for Scotland, including Andy Goram and Stuart McCall. ^ Northern Ireland were only in the British Home Championship after 1950. Before then, a team representing the whole of Ireland selected by the Irish Football Association was in the Championship. This change was due to the secession of the Republic of Ireland from the United Kingdom of Great Britain and Ireland. ^ Although the match was played at Wembley Stadium and was effectively a home game for England, Scotland had been drawn as the "home" team in the tie. ^ This match was a replay of the match originally staged on 5 April 1902 at Ibrox Stadium, which was abandoned after part of the stadium collapsed, killing 25 people. Funds raised by the replayed game contributed towards a disaster fund. ^ The annual match was suspended between 1915 and 1919 because of World War I. ^ The annual match was suspended between 1940 and 1946 because of the Second World War. Unofficial wartime internationals were played during the war. ^ The match also acted as a qualification match for the 1950 FIFA World Cup. ^ The match also acted as a qualification match for the 1954 FIFA World Cup. ^ a b This match also acted as a qualification match for UEFA Euro 1968. ^ The first goalless draw since the first ever fixture, 98 years earlier. ^ A friendly match arranged to mark the centenary of the Scottish Football Association. ^ a b England won 2–1 on aggregate and qualified for Euro 2000. 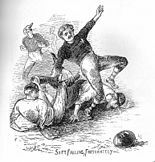 ^ A friendly match arranged to mark the 150th anniversary of The Football Association. ^ "A history of fierce football rivalry". BBC News. 13 October 1999. ^ Duke, Greg (6 November 2008). "Top 10 international rivalries". CNN. Retrieved 29 June 2010. ^ "Scots relish Auld Enemy showdown". BBC News. 12 November 1999. Retrieved 16 September 2007. ^ Marjoribanks, Brian (7 June 2010). "Scotland refuse to back England in South Africa as survey reveals just 24 per cent will support Fabio Capello's side". Daily Mail. UK. Retrieved 29 June 2010. ^ "You're watching the World Cup from Cumbria – the home of international football..." News and Star. 28 June 2010. Archived from the original on 6 September 2012. Retrieved 29 June 2010. ^ "A history of fierce football rivalry". bbc.co.uk. 13 October 1999. Retrieved 15 September 2007. ^ Chaudhary, Vivek (13 November 1999). "Passions hit fever pitch". The Guardian. UK. Retrieved 15 September 2007. ^ "England-Scotland matches, 1872–1999". Rec.Sport.Soccer Statistics Foundation. Retrieved 15 September 2007. ^ H.M., The Scotsman, 1 December 1870, page 12. ^ a b Charles W Alcock, The Scotsman, 28 November 1870, page 7. ^ Glasgow Herald, Monday, 7 March 1870; Issue 9415. ^ a b c d Barrett, p. 9. ^ a b c d e f g h i j k l m n o "Auld Enemy". Scottish Football Association. Archived from the original on 6 August 2010. Retrieved 17 July 2010. ^ a b c Mitchell, Paul. "The first international football match". BBC Scotland. Retrieved 16 September 2007. ^ "England Match No. 2". emglandfootballonline.com. Retrieved 26 June 2016. ^ "Scotland v England". Scottish Football Association. Archived from the original on 10 September 2012. Retrieved 16 September 2007. ^ Cameron, Neil (22 December 2005). "We'd Only Have Lost Eight If I'd Been Wearing Glasses". Daily Record. Trinity Mirror. Retrieved 15 August 2013. ^ Philip, Robert (10 August 2007). "Scots goalkeepers no longer a laughing stock". Daily Telegraph. UK. Retrieved 17 July 2010. ^ "Hapless Haffey finds absolution 40 years on". The Guardian. 16 April 2001. Retrieved 26 January 2019. ^ a b c d e "Wembley Wizards 1967". BBC. ^ "Tributes to Jim Baxter". BBC Sport. 14 April 2001. ^ Hughes, Rob (18 December 1995). "Draw eases England's path". The Times. UK. p. 21. ^ "Old enemies unite to prevent trouble at Wembley". The Times. UK. 19 December 1995. p. 40. ^ "Gazza's moment gives England momentum". The Independent. UK. 17 June 1996. ^ a b Wilson, Paul (16 June 1996). "Pride spurs Lionhearts". The Observer. UK. p. 12. ^ a b Hey, Stan (16 June 1996). "A sublime moment from the ridiculous". The Independent on Sunday. p. 30. ^ Lovejoy, Joe (16 June 1996). "Pure Gazza, pure genius". The Sunday Times. UK. p. 28. ^ Crawford, Ewan (27 May 2006). "Terror of the Scottish Raj". The Guardian. UK. Retrieved 15 September 2007. ^ "Gordon Brown answers your questions". The Independent. UK. 27 June 2007. Retrieved 17 July 2010. ^ Lacey, David (19 June 1996). "Scots so near and yet so far". Daily Mail. UK. p. 68. ^ "The Joy of Six: England's best performances since '66". The Guardian. UK. 30 May 2007. Retrieved 15 September 2007. England fans' joy was complete when Patrick Kluivert stole a late goal for the Dutch – and thereby deprived Scotland of a place in the quarter-finals. ^ Kelly, Graham (1 July 1996). "My Euro 96 Diary". The Times. UK. p. 33. Euphoria after the fantastic crowd behaviour at England v Scotland. The match could indeed be reinstated on a regular basis, but the fixture schedule is much heavier nowadays and you must consider the very heavy security arrangements that were in place. Would this need to be repeated? ^ "Scotland to meet England in play-offs". The Guardian. UK. 13 October 1999. Retrieved 16 September 2007. ^ "Scholes silences Scots". BBC News. 15 November 1999. Retrieved 16 September 2007. ^ "Running battles as fans clash". BBC News. 13 November 1999. Retrieved 16 September 2007. ^ Lacey, David (18 November 1999). "Hutchison restores Scots' pride". The Guardian. UK. Retrieved 16 September 2007. ^ "5 Good Reasons To Bring Back Home Internationals." Daily Record. 23 November 2007. ^ "Auld Enemy clash may return". BBC News. BBC. 9 January 2002. Retrieved 16 September 2007. ^ Grant, Michael (22 February 2004). "Auld Enemies could open Wembley". The Sunday Herald. Retrieved 16 September 2007. ^ "Scots eye summer England fixture". BBC Sport. BBC. 12 November 2007. ^ Palmer, Martin (3 February 2008). "England game impractical, admits Burley". The Observer. UK. ^ "England to face Italy and Scotland". www.thefa.com. The Football Association. 16 June 2012. ^ "England 3–2 Scotland". BBC Sport. BBC. 14 August 2013. Retrieved 14 August 2013. ^ a b "Scotland confirm rematch with England at Celtic Park". BBC Sport. BBC. 14 July 2014. Retrieved 14 July 2014. ^ "Scotland 1–3 England". BBC Sport. BBC. 18 November 2014. Retrieved 18 November 2014. ^ Pierluigi Giganti (18 November 2014). "Scozia-Inghilterra 1-3: gol di Oxlade-Chamberlain, doppio Rooney e Robertson" (in Italian). gazzetta.it. ^ "World Cup 2018: England and Scotland drawn together". BBC Sport. BBC. 25 July 2015. Retrieved 25 July 2015. ^ "World Cup 2018: England host Scotland on Armistice Day". BBC Sport. BBC. 26 July 2015. Retrieved 26 July 2015. ^ England v Scotland, The Football Association official website. ^ Scots passing pioneers shaped football, The Scotsman, 22 March 2008. ^ a b Forsyth, Roddy (15 September 2010). "Manchester United v Rangers: Walter Smith's battlers restore Scottish pride". Daily Telegraph. UK. Retrieved 15 September 2010. ^ a b c McDaid, David (7 August 2009). "Celtic's Battles of Britain". BBC Sport. ^ a b "How have Scottish clubs fared against English opposition?". UEFA. 27 July 2018. Retrieved 27 July 2018. ^ "Tottenham 0 - 0 Hearts (agg 5 - 0)". BBC Sport. BBC. 25 August 2011. Retrieved 25 August 2011. ^ Lamont, Alasdair (30 August 2012). "Liverpool 1–1 Hearts". BBC Sport. BBC. Retrieved 20 September 2012. ^ English, Tom (26 July 2018). "Aberdeen 1–1 Burnley". BBC Sport. Retrieved 27 July 2018. ^ Gibbons, Glenn (11 September 2001). "Celtic trust in beginners' pluck". The Scotsman. UK. Retrieved 17 July 2010. ^ Ronay, Barney (8 April 2014). "Manchester United: how did they get into this mess?". The Guardian. Guardian News and Media. Retrieved 22 April 2014. Under Ferguson, United dominated the Premier League, as inaugural champions of the rebranded top tier in 1993 and its most visible presence for the next 20 years. ^ Taylor, Daniel (16 July 2010). "Sir Alex Ferguson rejected England twice to stay at Manchester United". The Guardian. UK. Retrieved 17 July 2010. ^ Campbell, Nicky (13 June 2007). "Reluctant Sassenach Baker who pioneered the Beckham trail". The Guardian. UK. ^ a b Forsyth, Roddy (15 February 2008). "Premier League could make a short leap north". Daily Telegraph. UK. Retrieved 17 July 2010. ^ Traynor, James (12 February 2009). "Celtic drop out of football's rich list". Daily Record. Retrieved 17 July 2010. ^ "See you, Murray". Mail on Sunday. 6 June 2006. ^ "McConnell explains England stance". BBC News. 25 May 2006. ^ Liddle, Rod (7 October 2007). "Nelson Dida's Comedy Act is No Laughing Matter". The Sunday Times. UK. Retrieved 27 January 2010. , in which English journalist Rod Liddle announces, "I already have my Ukraine flag ready for Scotland’s next fixture". ^ "Do I or Don’t I Sing Flower of Scotland? What’s Important is Helping George Win", The Sunday Times, 23 March 2008. Douglas Alexander interview with Terry Butcher on the subject of the latter's appointment as assistant to Scotland manager George Burley, in which Butcher is quoted, "I never hide away from the fact that when Scotland got knocked out of World Cups in the past, like in 1982 and 1986 and 1990, we cheered the roof off, the England team did that, but George has asked me to do a job for him and that's something I want to do". ^ Nicoll, Ruaridh (25 June 2006). "The 'any-side-but-England' strategy is corrosive". The Guardian. UK. ^ Cochrane, Alan (25 June 2006). "We Scots just canna cheer for the Sassenachs". Daily Telegraph. UK. ^ a b c Kelly, Jon (11 June 2010). "What's behind Anyone But England?". BBC News Magazine. BBC. Retrieved 12 June 2010. ^ Cosgrove, Stuart (29 March 2007). "I Would Walk 500 Miles to Savour Hampden Roar". Daily Record. Archived from the original on 8 September 2008. Retrieved 26 January 2010. ^ Clark, David (3 June 2002). "Should I Fly my Kilt for England?". New Statesman. UK. Retrieved 26 January 2010. ^ Powell, Jeff (26 January 2001). "Eriksson an Einstein? Don't be surprised if Forrest Gump comes into the big equation". Daily Mail. UK. Retrieved 26 January 2010. ^ a b Oliver, Brian (3 June 2001). "Why aren't England fans like the Tartan Army?". The Observer. UK. Retrieved 26 January 2010. ^ a b O’Donnell, Frank (30 May 2002). "More Scots back England than their World Cup opponents". The Scotsman. UK. Retrieved 26 January 2010.